A young girl enters a new foster home unsure of what lies ahead. What few possessions she has, she carries in a trash bag. This shouldn’t be any child’s story, but for many kids in the foster system, it’s a familiar narrative. It's also the story of our project leader, Devon Stinson. She pitched the project at the 2017 UpDayton Summit and continues to rally support. By partnering with Agape for Youth to expand their Comfort Bags program, the project ensured that children stepping into a new home have something to call their own. As Devon told the UpDayton Summit audience, kids facing this sudden transition need to know that Dayton cares about them and hasn't forgotten them. In 1950, Harlem teacher Holcombe Rucker started a basketball tournament to motivate young people to engage with their community and commit to their education. What he created became a national symbol of inclusiveness and the career-launchpad of numerous NBA legends. 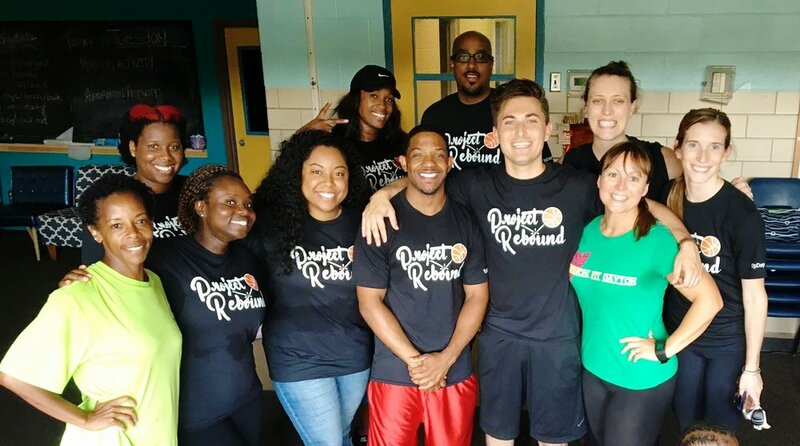 Project Rebound uses basketball and other sports as a language to bridge divides and give a boost to Dayton children. Specifically, the project challenges young professionals to connect with Dayton children and teens through the sports and activities they love. Organizations like Big Brothers Big Sisters, Boys & Girls Club, City of Dayton Youth & Recreation Services, the Dakota Center, and many more constantly need more adults to step up as volunteers, coaches, and mentors. Project Rebound leaned on UpDayton's network to drive new people into these roles. Karlos and Moses are the co-founders of The Conscious Connect, Inc., a nonprofit with the mission to eradicate urban “book deserts.” Their project seeks to activate underutilized spaces along the Salem Peace Corridor welcoming places to read a book, have an event, or learn something new. The Reading Park Project promoted education, peace, and culture through the revitalization, beautification, and activation of an underutilized space. Through the power of community building, the project established a creative and communal space for children, youth, and families to engage in educational, cultural, and civic activities—which cultivates communal ownership of safety zones and restore neighborhood pride within the Salem Peace Corridor. The Longest Table concept started in Tallahassee, FL and has spread to cities all around the country. At the 2016 Summit, Bryan Stewart pitched the idea of bringing the concept to Dayton. The project has had incredible community support ever since. On Saturday, October 15th, 2016, over 300 Daytonians gathered for a community meal and dialogue on the Third Street Bridge - Dayton's Peace Bridge. The goal of the event was to connect Daytonians from every corner of the city and region, to meet people we never would have met otherwise. People were randomly assigned to a table and spent the afternoon learning about each other and the neighborhoods we love. 42 different zip codes were represented at the event. Community leaders and participants didn't want the conversation to stop there. Thanks to the support of the City of Dayton Human Relations Council and City of Dayton Neighborhood Mini Grant Program, the Longest Table project team continues to host an annual meal. So join us and take a seat at the table to connect with individuals and neighborhoods you’ve never ventured to. Imagine giant D-A-Y-T-O-N letters stamped boldly into our urban landscape. The letters will be an essential photo stop for every Dayton visitor and resident. The design, called “Dayton’s Duality,” is an iconic and elegant piece that celebrates our city’s past while also demanding a bright future. It proudly writes our city’s name across its heart. A New Dayton Icon was a project idea pitched in April 2016 at the UpDayton Summit by Kelly Sexton with the support of K12 Gallery & TEJAS. The project set out to bring a new, iconic public sculpture to Dayton, designed and built by the community. Over the next six months, UpDayton assembled a team to drive the design and creation of this new sculpture. A Call to Artists was put out to the community, and a panel of judges gathered to select the winning design. “Dayton’s Duality” submitted by Nick Gaskins and the Bing Design team was selected as the winner. With a concept chosen, the project team is ready to get to work finding a great location and bringing A New Dayton Icon to life! Funding and constructing the Dayton Icon project is a big endeavor that UpDayton will not be able to complete alone. This project is seeking major partners to assist with the siting, fundraising, and fabrication of the icon. If you have leads to these resources please email director@updayton.org. Dayton Inspires is a campaign to shift the perception of Dayton by inviting Daytonians to celebrate and share the ways our city inspires them. The campaign has three major components: online messaging (social media & digital marketing), on-the-ground messaging (murals, t-shirts, stickers, posters), and volunteer action days (clean-ups and other massive volunteer efforts). The Dayton Inspires brand continues to reach an enormous audience on social media thanks to the in-kind support of Catapult Creative who manages the brand. #DaytonInspires has been used more than 37,000 times. There are also three Dayton Inspires murals in downtown Dayton - "selfie stations" at Courthouse Square and BRIM in the Oregon District and a third mural at the Cannery. Additionally, the Dayton Inspires team has been hosting an annual clean-up with hundreds of Daytonians collecting trash in neighborhoods and vacant properties that need it most. The growth of these events has been made possible by two grants from the City of Dayton and a partnership with Keep Montgomery County Beautiful. A collaboration between Bike Miami Valley and UpDayton volunteers, the project team created a more bike-friendly Dayton by increasing the number of secure bike racks near Dayton businesses and along neighborhood corridors. The team initially focused on the Brown Street corridor, but a grant from Public Health Dayton & Montgomery County enabled the purchase of more than 71 bike racks. The City of Dayton's Public Works team has installed the green "Creating Healthy Communities" racks in the Wright Dunbar Historic District, Brown Street business corridor, East Third Street corridor, and a number of other areas that were short on bike parking. The Wright Now Downtown project launched in April 2014 aiming to better connect Wright-Patterson Air Force Base employees to downtown Dayton. Led by young, the project compiled resources such as downtown guidebooks, Five Rivers MetroParks brochures, and other resources into orientation packets for new employees and their families at the base. These welcome packets have become a permanent part of UpDayton's Discover Dayton program. was divided into activities such as active lifestyle, dining, museums, culture, and nightlife. The I Did Dayton team also coordinated with student groups on campuses, developing a Facebook page and city map for students to put into their dorm rooms. This culminated in a meet-up at RiverScape MetroPark for professionals and college students to mix and mingle, before heading to the Trolley Stop for dinner. Additional meet-ups were held at Urban Nights and again at the Dayton Visual Arts Center. The project evolved into the Campus Challenge at the next UpDayton Summit and grew into a permanent campus outreach arm of UpDayton and the Discover Dayton program. The Streetvival Project set out to create a fun, accessible, and visually appealing open space for creativity and community-centered activity in the Twin Towers neighborhood. The team's efforts resulted in an interactive wall mural installation that hosts three chalkboards with the following prompts: “If I could change one thing it would be…”, The best part of my community is…”, and “If I could do or be anything I would…” The prompts are designed to inspire neighborhood residents and guide them toward a place of community-focused positive action and change. East End Community Center, Ruskin Elementary, the Twin Tower Neighborhood Association, Requarth Lumber, Pizza Factory, and Home Depot all stepped up to make the project idea a reality. Over 100 neighborhood residents attended the grand opening of the chalk board mural, where UpDayton provided pizza, and neighbors chalked their ideas and responses on the new boards. Stop by and add your own responses next time you're in Twin Towers! This project team envisioned a Dayton more welcoming to a diverse immigrant population, and an immigrant population with better access to literacy resources. With help from a number of local organizations focused on promoting diversity in Dayton including 2nd Street Market, Welcome Dayton, East End Community Services, Catholic Social Services, and the Turkish American Society of Dayton, the Diversity in Action team partnered with Dayton Metro Library to host a book drive where collected books were sold to raise funds for foreign language books. To promote and distribute the foreign language texts among immigrant residents, four Take It & Read It stations were installed in neighborhoods and community centers with large immigrant populations. The books were recommended by the library. They included books in English, French, Arabic, Swahili, Spanish, Turkish, and Russian. The Waggle, Dayton’s own version of San Francisco’s Wiggle project and North Carolina’s Walk Raleigh project combined these two major cities’ benchmark efforts to create citywide bicycling routes and walking signage. The Waggle project aimed to increase walking and on-street bicycling downtown with signage that highlights points of interest. When the Waggle team set out to complete the project’s mission, they focused on mapping out specific locations of interest downtown that residents typically drive to or don’t visit at all because of their distance to other parts of the city. The team then developed a proposal plan and worked with city engineers to gain signage allowance near the street. The signs were branded, created, and posted with the help of the Downtown Dayton Partnership. The signs promoted the walkability of downtown by highlighting the travel time by foot between various landmarks downtown. The team hung over 40 signs on street posts downtown.